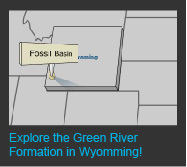 Check out the interactive below to explore the fieldwork process undertaken by Dr. Lance Grande and his team in southwest Wyoming. You'll see how fossils are discovered, excavated, and shipped back to the Museum for preparation and display. And you'll get a sneak peek at some great Green River fossils housed in the Museum's collections. During their 2008 fossil-hunting expedition, Dr. Grande and his team filmed a series of Video Reports describing their finds and the experience of working and living in the field. You can view these videos individually below, or you can visit The Field Museum's Expeditions YouTube Channel to see all our Expeditions videos. To view Dr. Grande's videos in high-definition, you can also visit our Expeditions Channel on Vimeo.